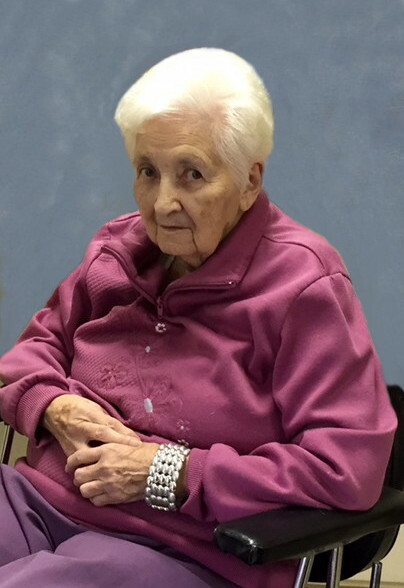 Mrs. Isobell Williams Kirby, 88, wife of the late Eli Judson "EJ" Kirby, Jr., died Sunday, September 2, 2018, at Southland Nursing Home, Florence. Funeral services will be 3:00 P.M., Wednesday, September 5, 2018, at New Zion Baptist Church. Burial, directed by Carolina Funeral Home, will follow in the church cemetery. The family will receive friends from 1:30 – 3:00 P.M. at the church prior to funeral services on Wednesday, and at other times at the home of Timmy and Heather Matthews, 2620 W. Old #4 Highway, Scranton, SC 29591. Mrs. Kirby was born March 24, 1930, in Florence County, a daughter of the late Jim Murray Williams and Alma Hudson Williams. She was a licensed cosmetologist, retired from Talon Industries and was formerly employed with Country Cousins Bar-B-Q of Scranton for many years. Mrs. Kirby was a member of New Zion Baptist Church, where she served in the Nursery Department and was a member of WMU. Surviving are two Godchildren, Teresa Matthews Miles and Timmy (Heather) Matthews, both of Scranton; four God-grandchildren, Michael (Tiffany) Eaddy, Jr., Kathryn Eaddy, John Timothy Matthews and Ashlee Caroline Matthews; special nephew, Larry (Donna) Williams of Florence; special niece, Faith Hutchinson of Florence; and a number of nieces and nephews. Mrs. Kirby was preceded in death by her siblings, James A. Williams, Greta W. Johnson, Lena W. Flowers, Pearl W. Foster and Doris W. Geddings. Memorials may be made to New Zion Baptist Church, c/o Kim Allen, 347 McAllister Mill Road, Scranton, SC 29591. The family would especially like to thank Southland Nursing Home staff and McLeod Hospice staff, for their care and concern for Mrs. Kirby and her family during this time.